Cool Hand Poker is a site dedicated to providing players with unbeatable online poker entertainment with an emphasis on fun. The site discourages pros, hustlers and sharks and instead encourages amateur players and those looking for some simple and straightforward poker action at different levels. Cool Hand Poker is an unusual poker site. That’s because they have opted for a strategy of targeting new poker players who are keen on learning, rather than the professional “sharks”. They do this by offering low limit tables, providing a “safe” network option that sees the players in their rooms playing each other rather than going up against the big boys at other networks, and allowing players to only play at three tables simultaneously. Cool Hand offers a Bad Beat Progressive Jackpot, freerolls every hour and the option to play slots, blackjack and roulette in the poker software. Their sign-up deal is a cool €200, but it is paid out in €10 increments for every €1 raked. You will however get a €10 bonus on your first successful deposit. Everytime you play at Cool Hand Poker you earn Cool Points. Convert your Cool Points and get instant cash back to your poker account. Cool Points Cash Back is available to all players. Play Poker > Earn Cool Points > Get Instant Cash Back! As a new player at Cool Hand Poker, you can take part in an exclusive €500 New Player Freeroll This is a great oppurtunity to have some fun and boost your bankroll. If you have No Bankroll? No Problem! 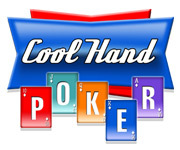 You still have a chance to hit it big with Cool Hand Poker. Play in any one of their daily €100,000 GTD Freeroll Feeders and stand a chance to win your way to the €100,000 GTD REBUY Tourney. Freerolls take place every hour. Cool Hand Poker have a great variety of games. Whatever players are keen to trying out, this site will arrange to have it. Games include Texas Hold ‘em, Five Card Stud, Seven Card Stud, Omaha and one on one poker. UKash, PaySafeCard, Click2Pay, ClickandBuy, Bank Transfer, Visa / Master Card, EntroPay, WebMoney, Neteller, MoneyBookers an more.